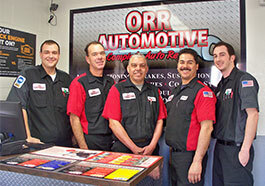 If your vehicle is having vibrations or squeaking while accelerating, clicking or popping while turning, Orr Automotive can help you determine the underlying cause of your problem. There are different types of drivelines depending on whether your vehicle has rear wheel drive, front wheel drive, four-wheel drive, or all-wheel drive. Rear wheel, four wheel or all-wheel drive vehicle your vehicle will have a drive shaft. The drive shaft connects to the transmission/transfer case and differential through a series of universal joints. Most universal joints are sealed and don’t require periodic lubrication. However, regular inspection is recommended. Front wheel drive vehicles have two drive axles. The drive axles turn the wheels. The constant velocity joints are sealed with a boot and are not serviceable. If the boot tears the CV joint will lose its grease and leave the joint exposed to weather and road debris. This will eventually damage the joint.